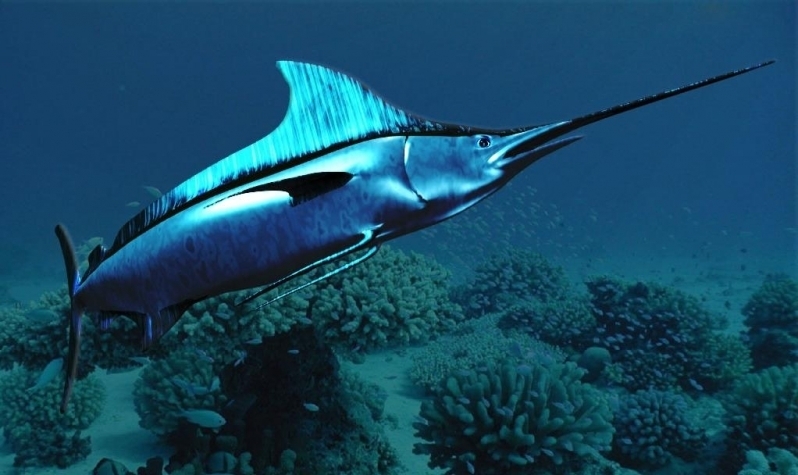 The Swordfish is a large marine fish of tropical & temperate waters throughout the world. 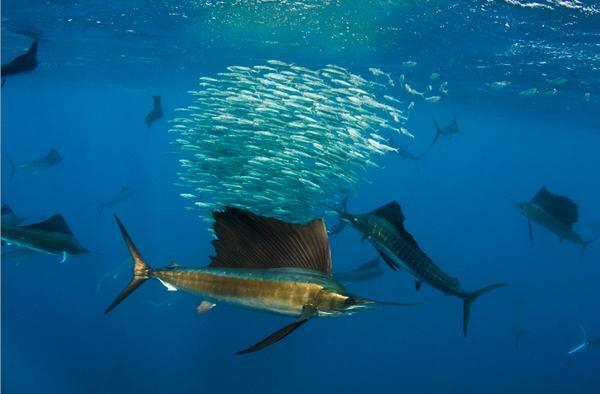 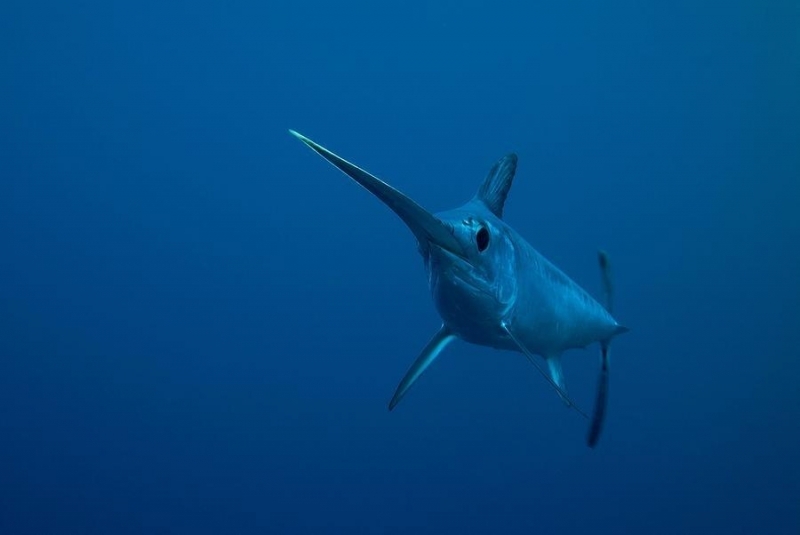 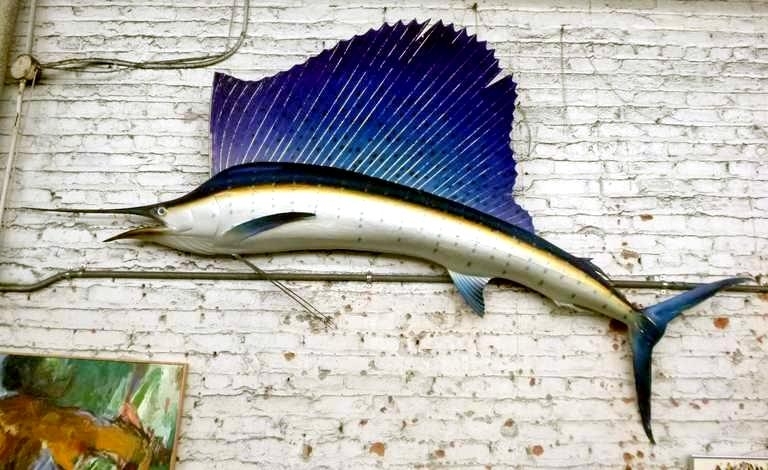 In appearance the Swordfish resembles the Sailfish & Blue Marlin but has a smaller dorsal fin (or sail), a flattened rather than round bill (or sword) and no scales or pelvic fins. 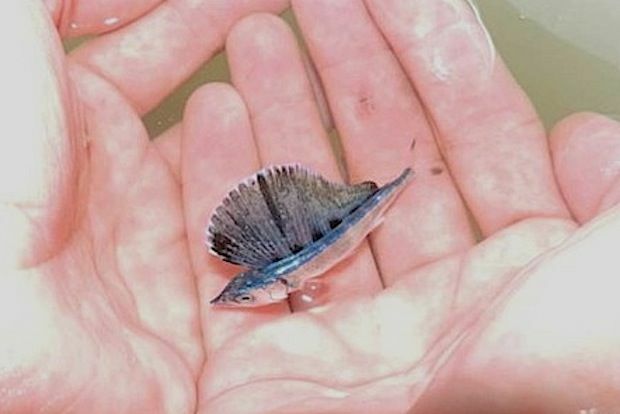 Depending on the individual fish, the back & sides are brownish to black, the underparts whitish. 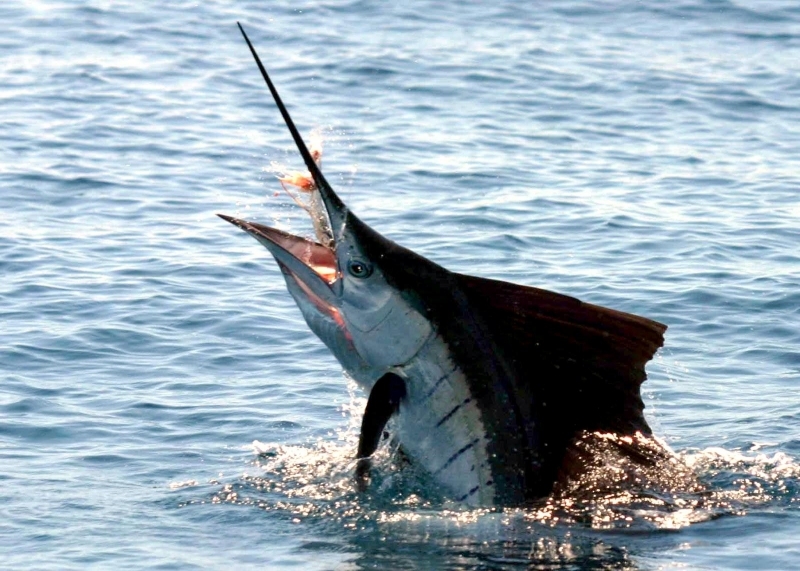 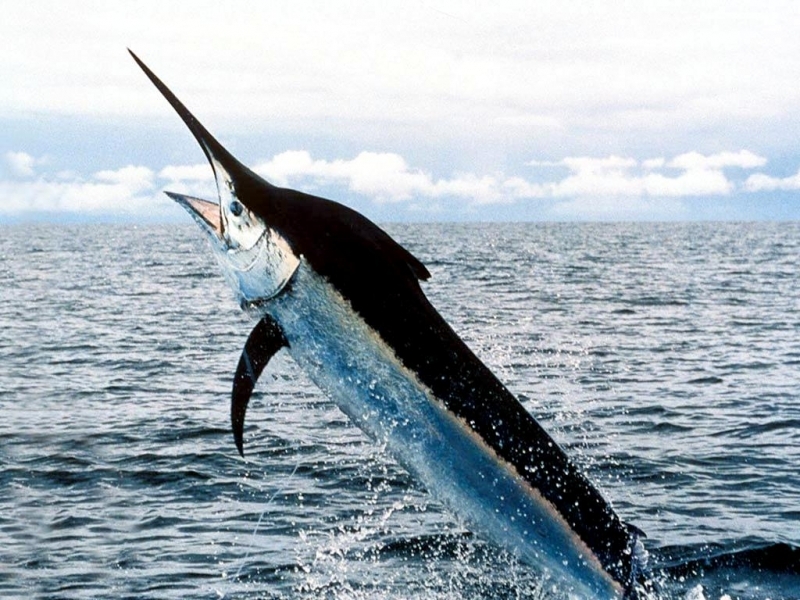 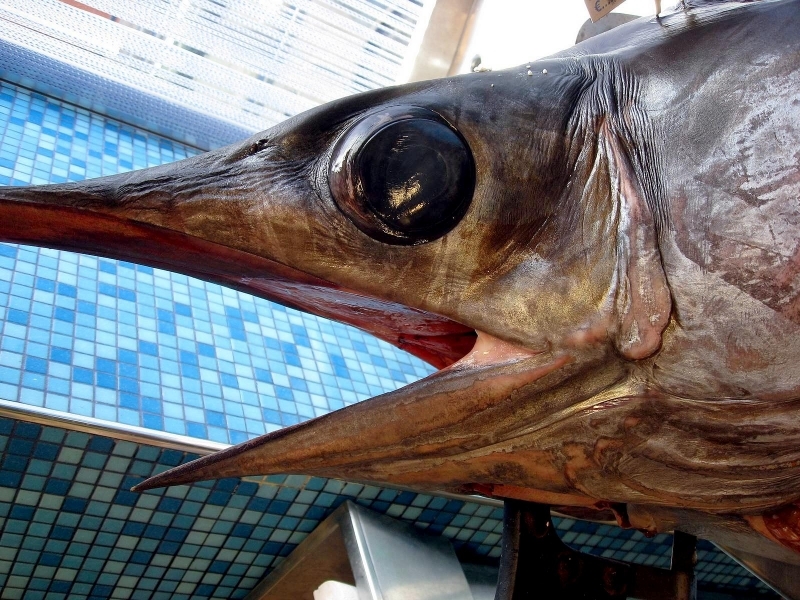 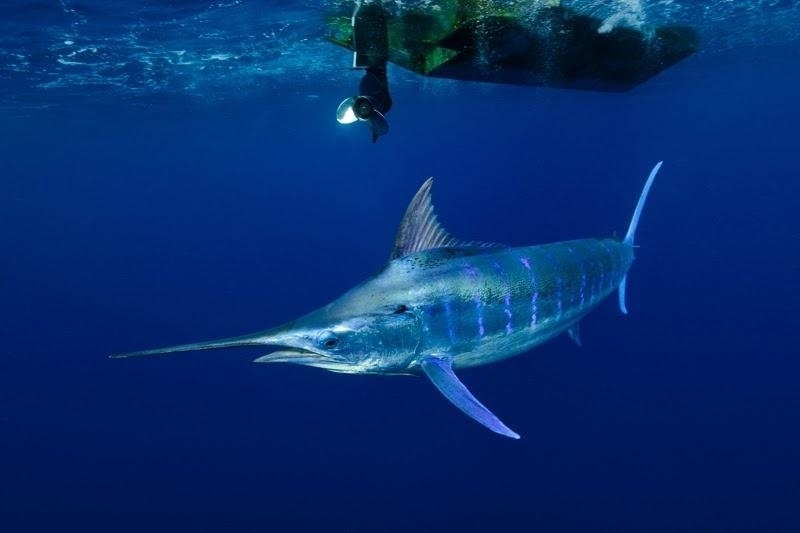 Swordfish can weigh more than 1,000 pounds, but the average weight is from 150 to 250 pounds. 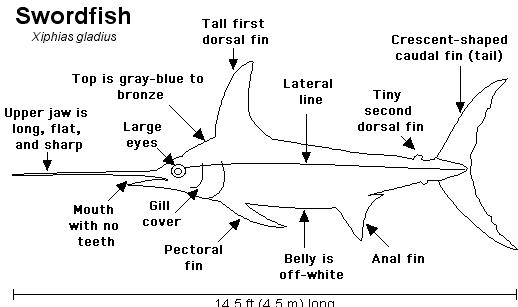 Average length is about 7 feet; some reach 15 feet. 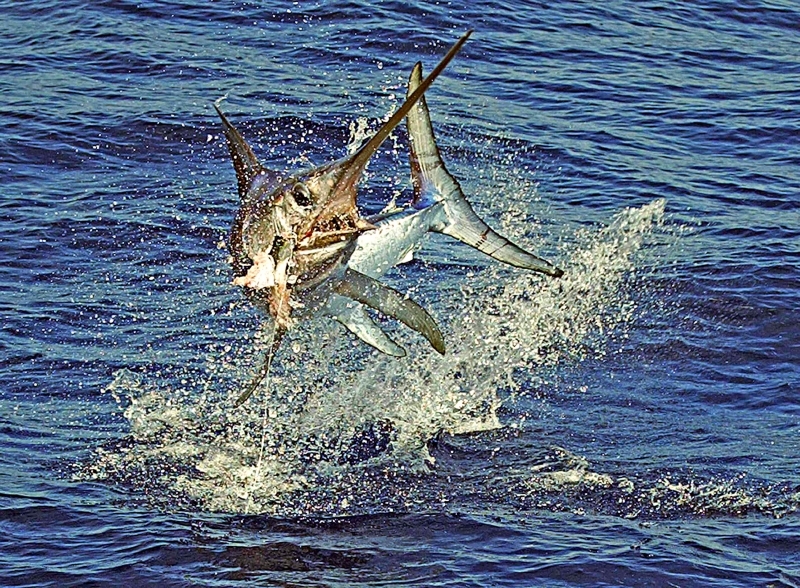 Up to one-third of the length may be taken up by the sword—the sharp, flattened extension of the upper jaw. 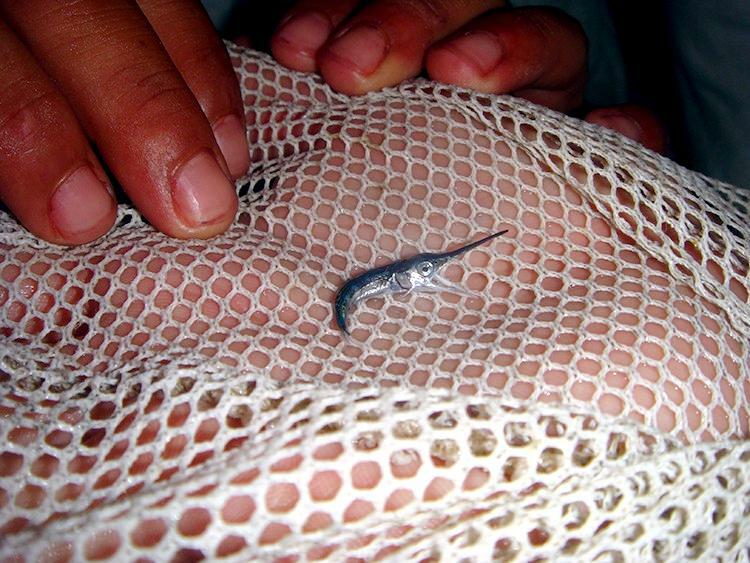 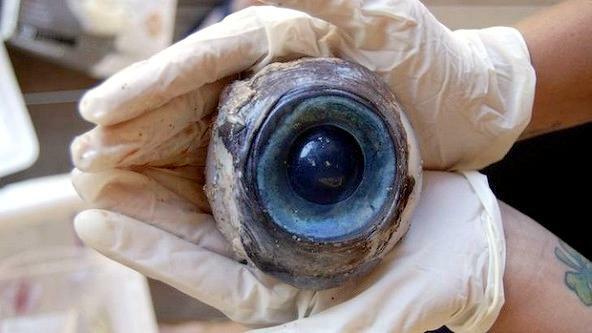 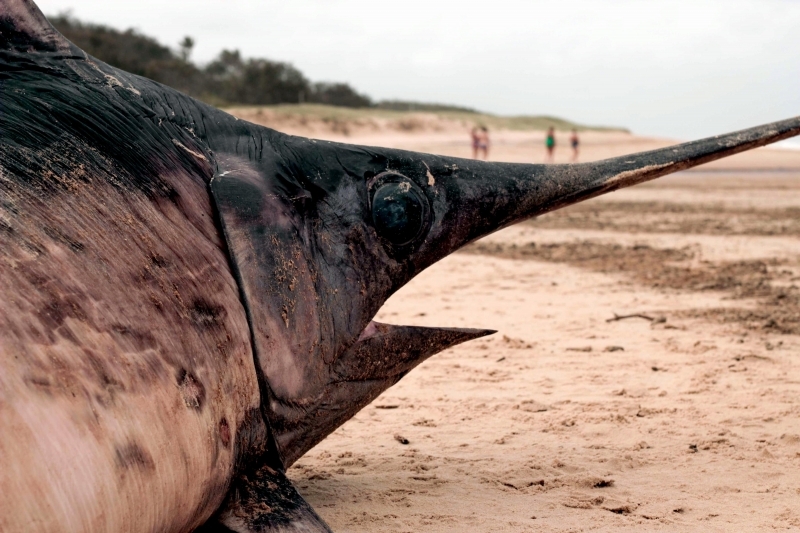 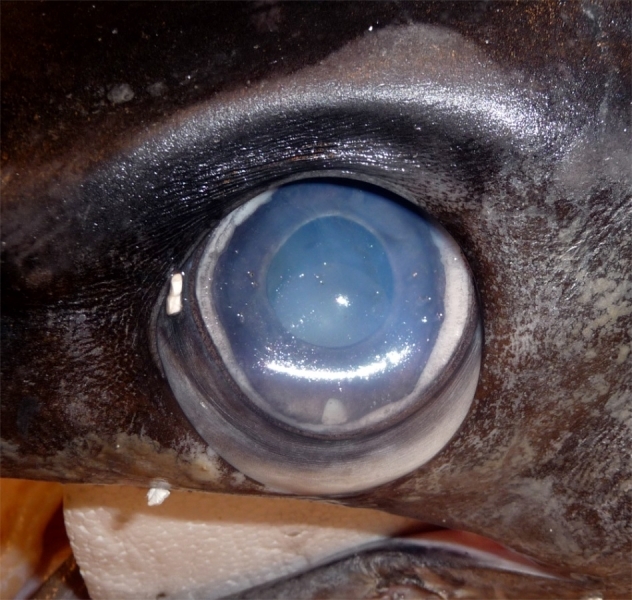 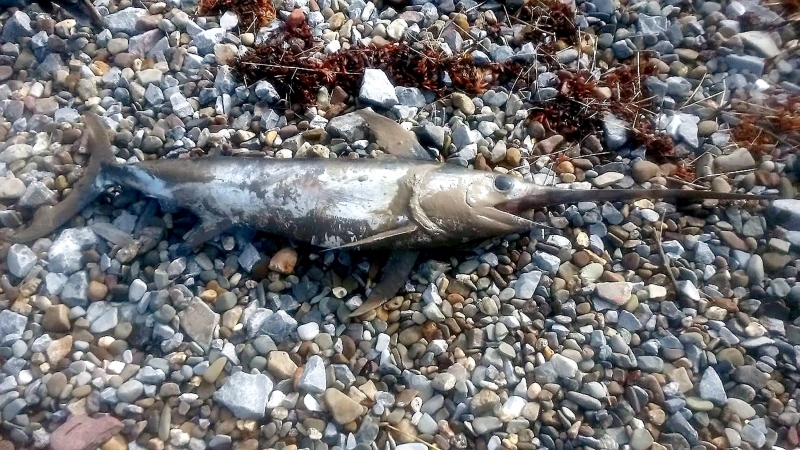 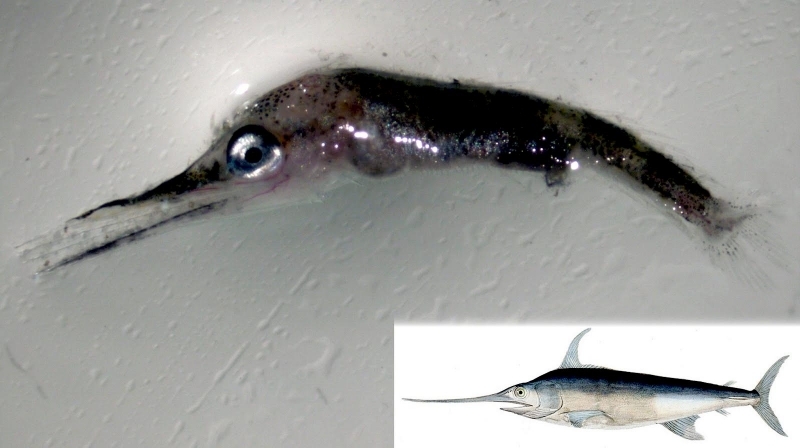 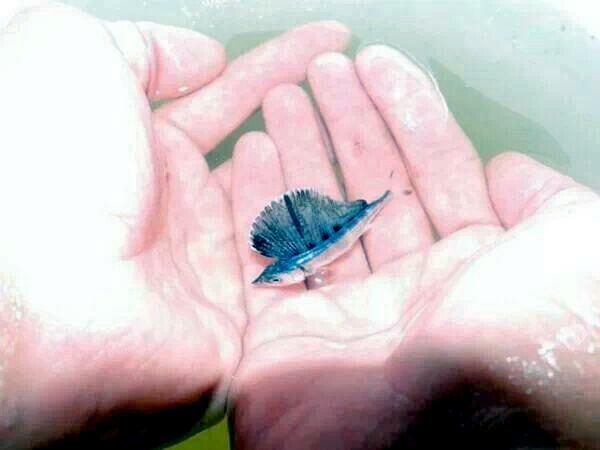 A newly hatched Swordfish has teeth but no sword. 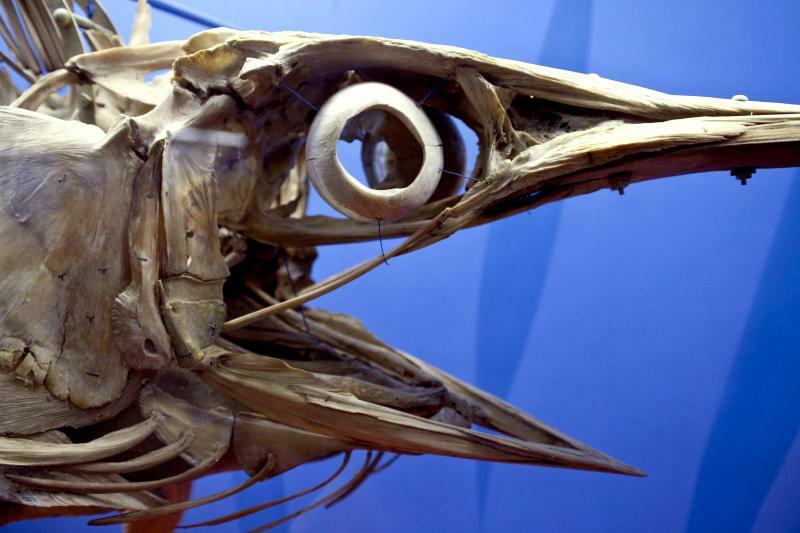 Eventually the teeth disappear and the upper jaw lengthens into the sword. 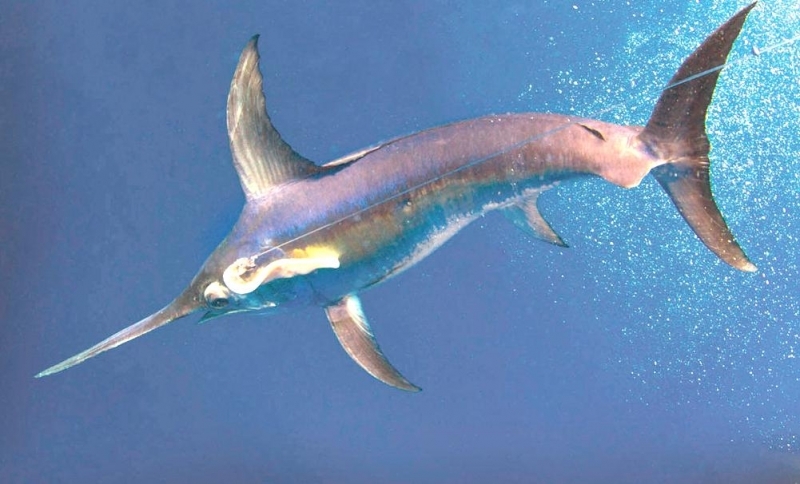 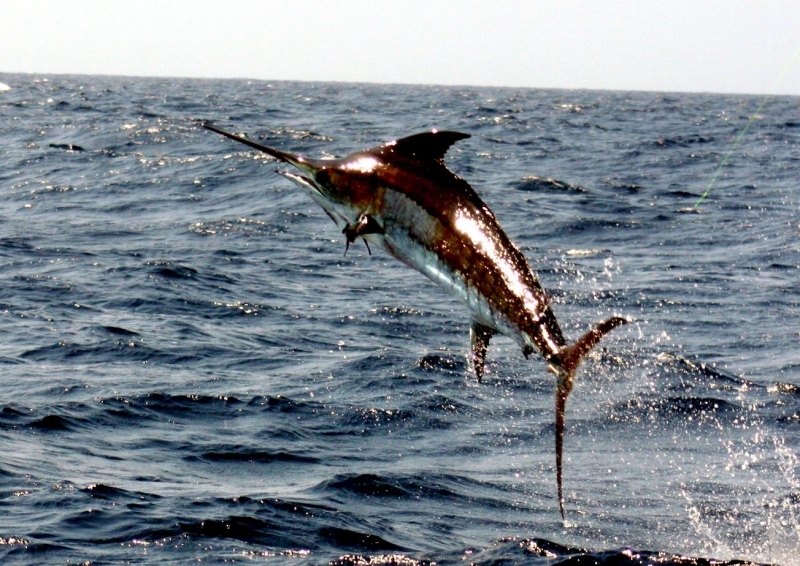 The Swordfish is an extremely fast swimmer and can make powerful leaps. It feeds mainly on other fish & squid. 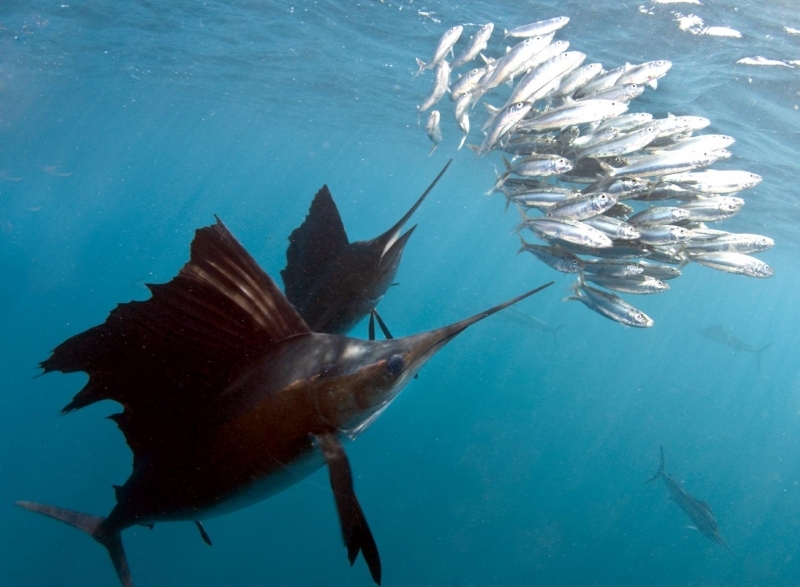 When it encounters a school of fish, it kills or stuns its prey by slashing about with its sword. 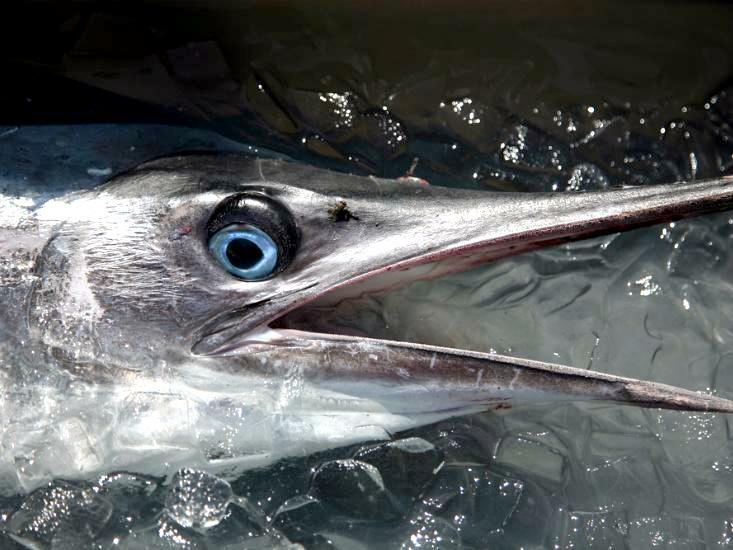 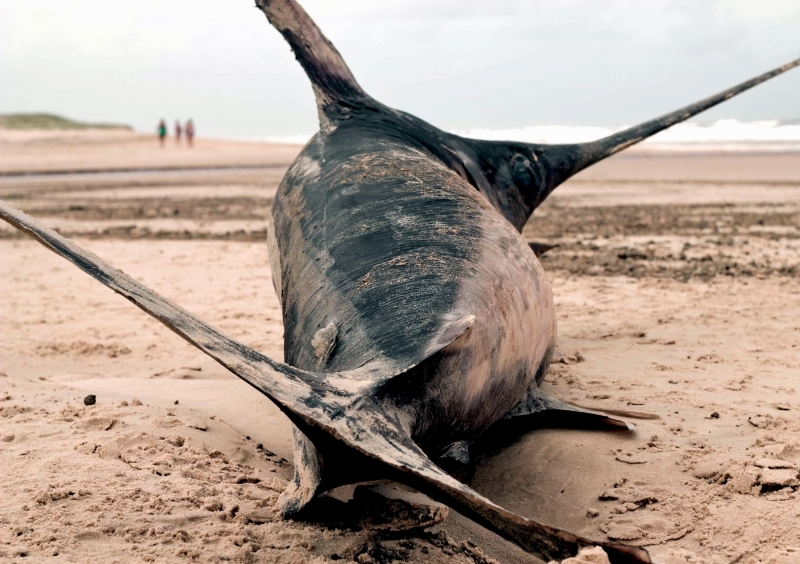 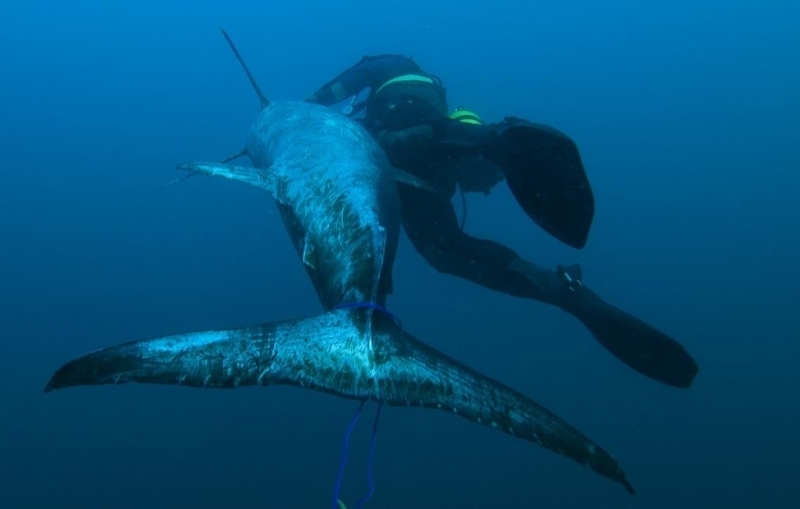 The Swordfish is an important food fish and thousands of tons are taken annually by commercial fishermen. 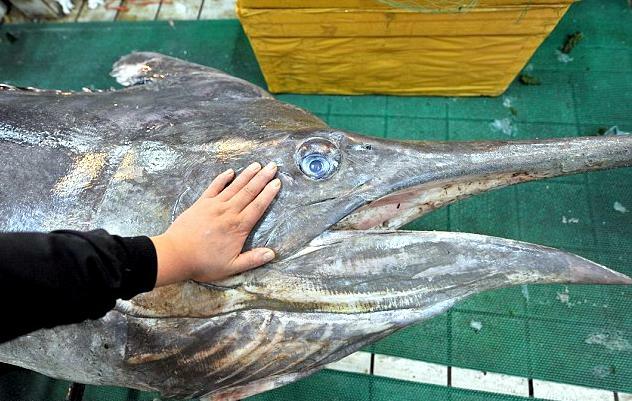 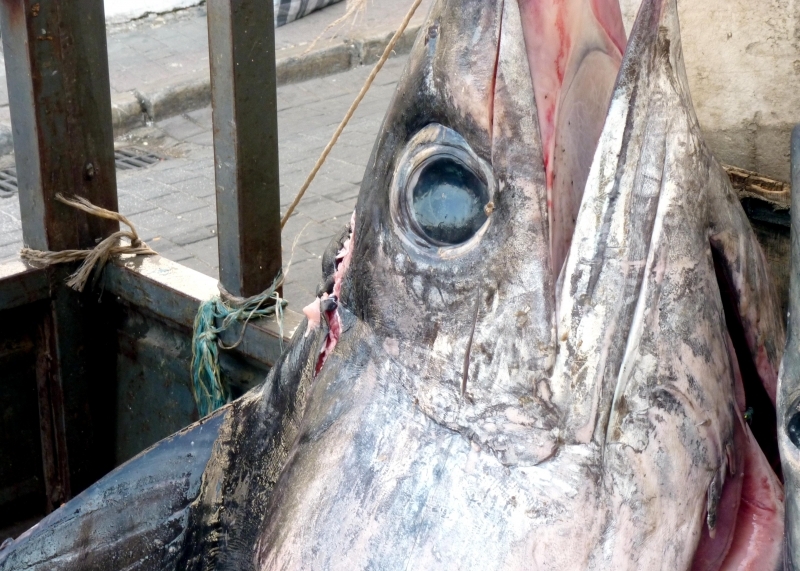 Japan accounts for about one-fourth of the world catch. 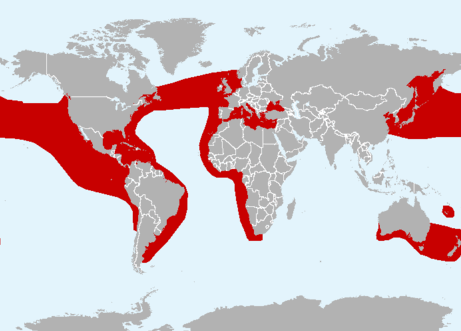 Other leading countries are Spain, the United States, Italy, the Philippines & Mexico. 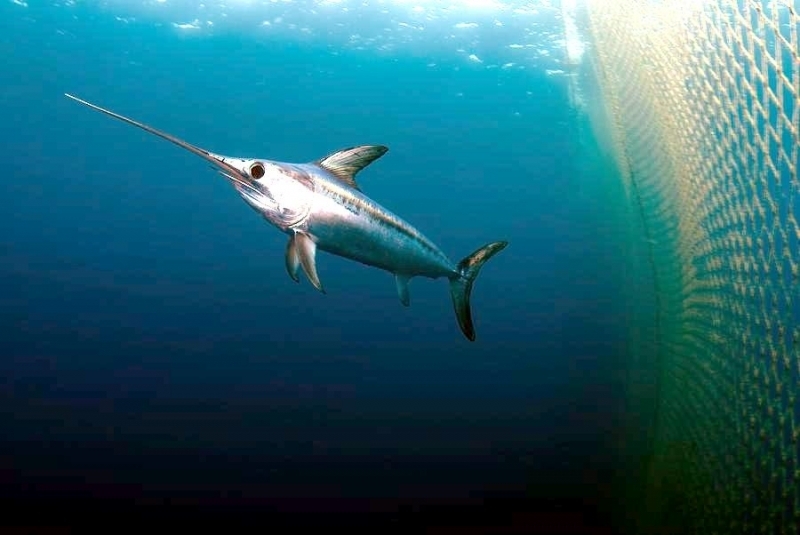 Because the Swordfish can slash its way out of nets, most of the commercial fishing is done by harpooning or by setting out lures on lines. 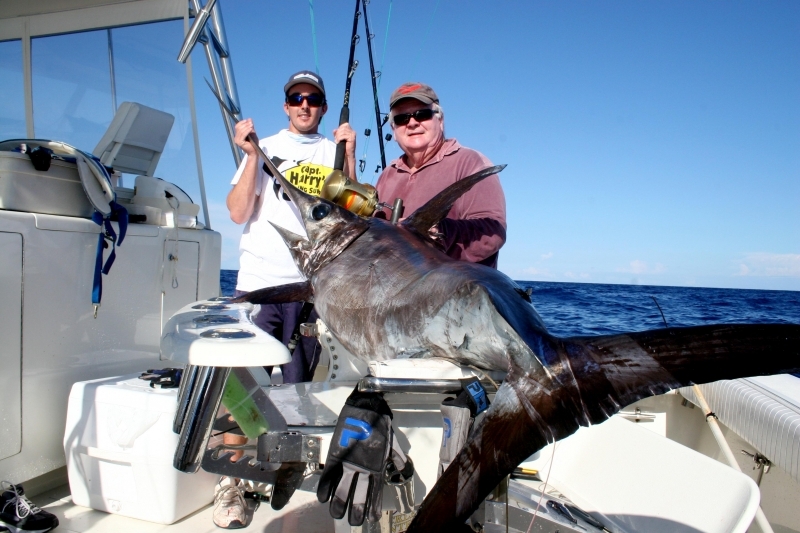 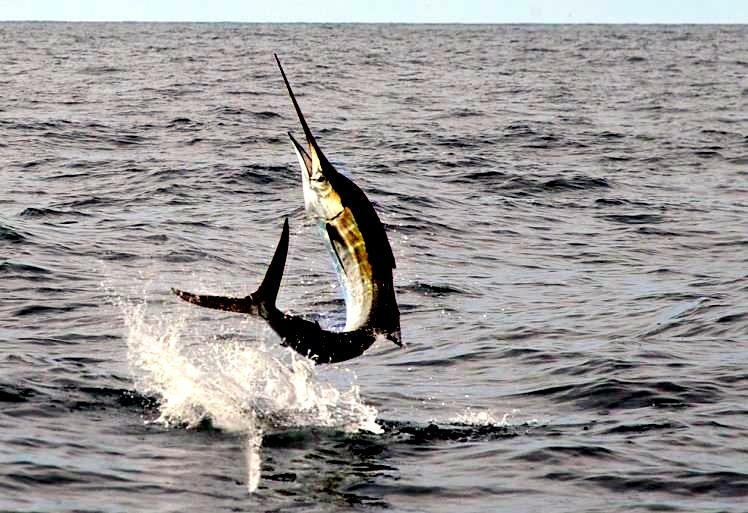 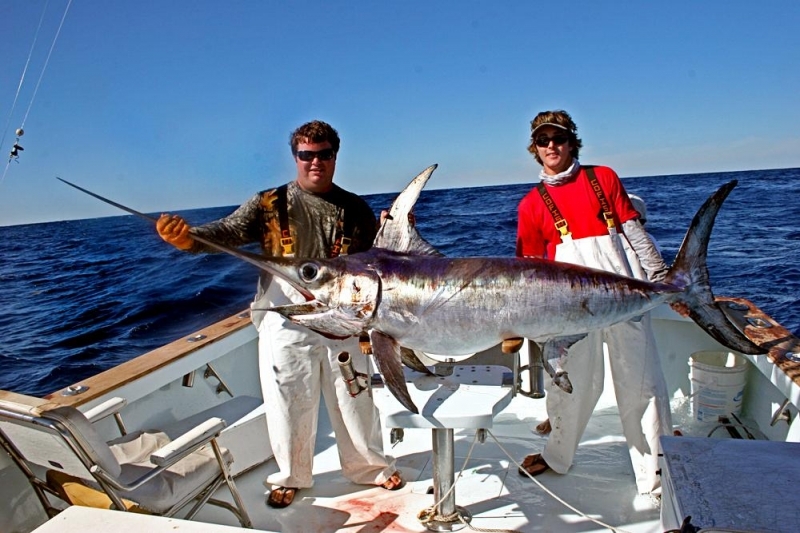 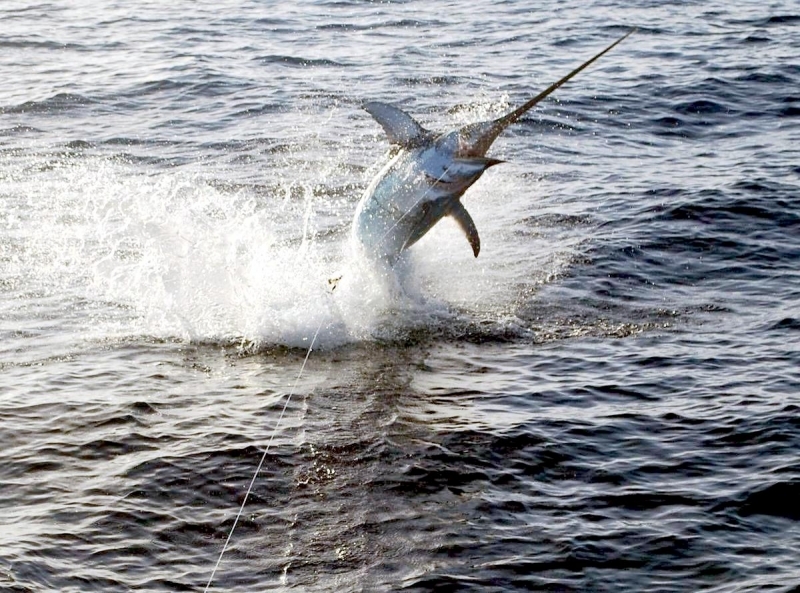 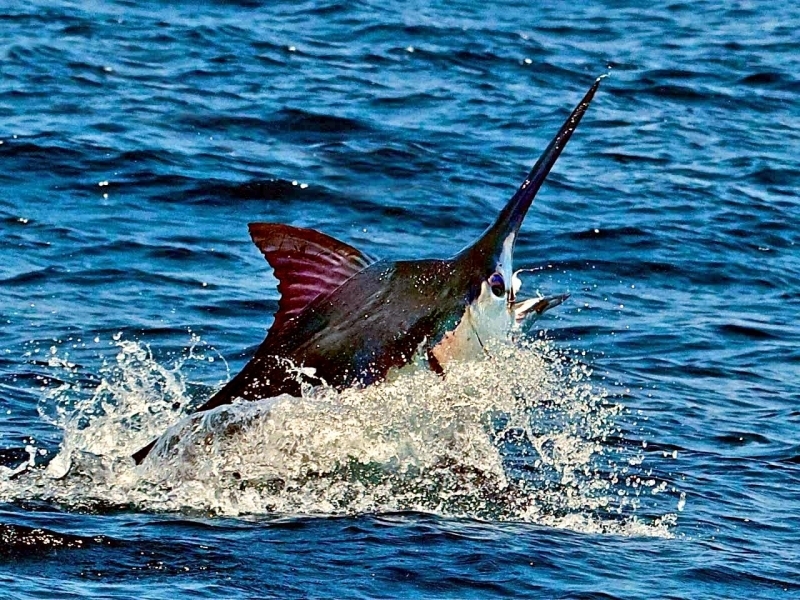 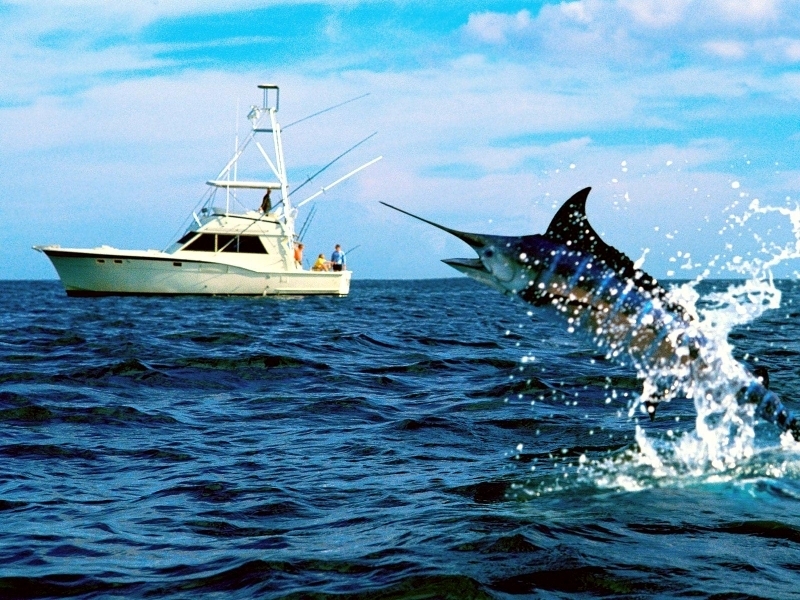 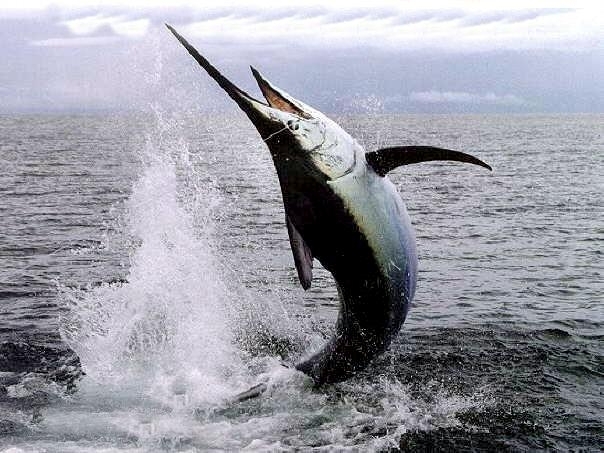 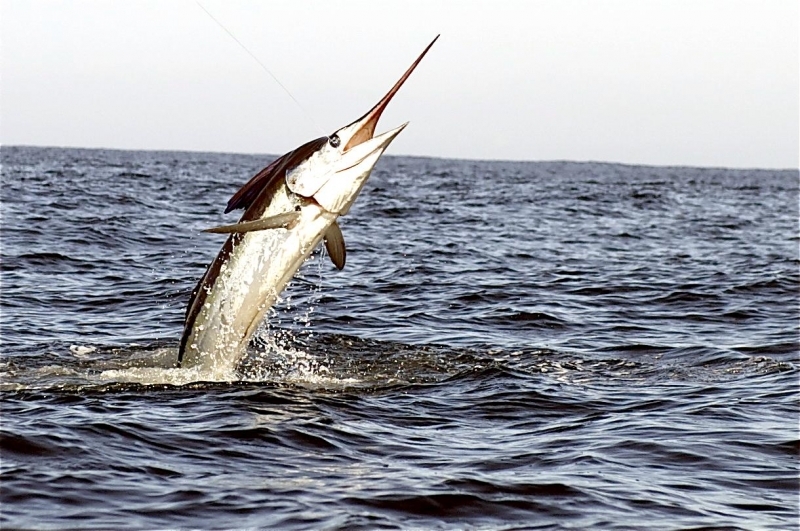 Fishing for Swordfish with rod & reel is a popular sport. 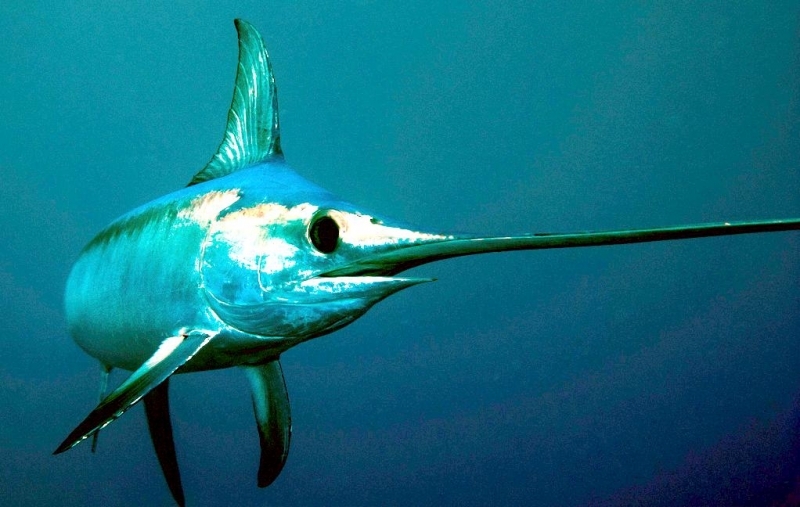 A Swordfish has a long, flat upper jaw that looks like a sword. 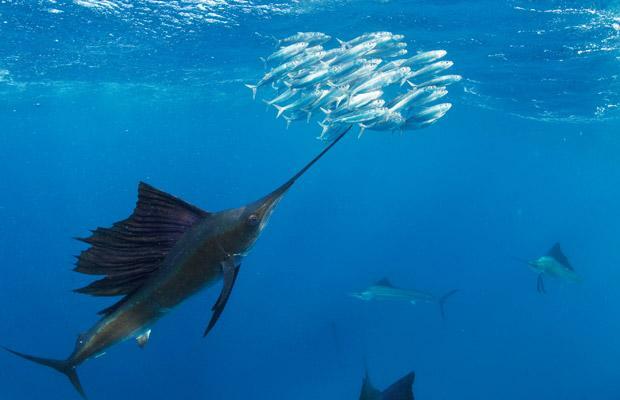 Scientists believe it may use its sword to break up groups of fish and then a Swordfish can attack the fish one at a time. 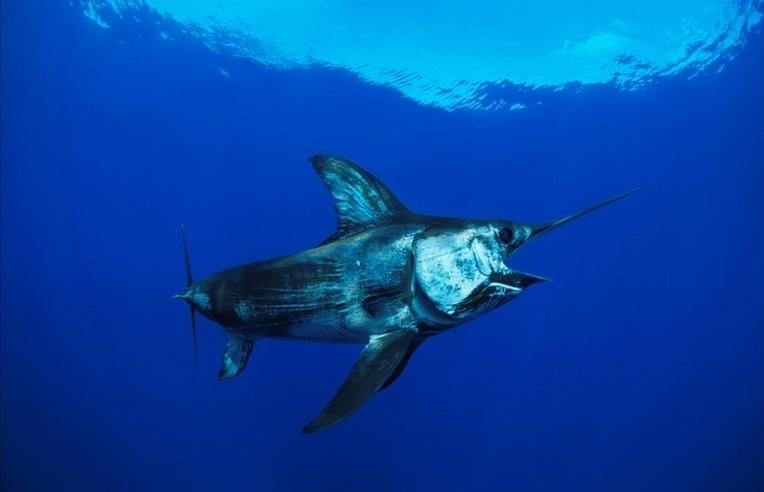 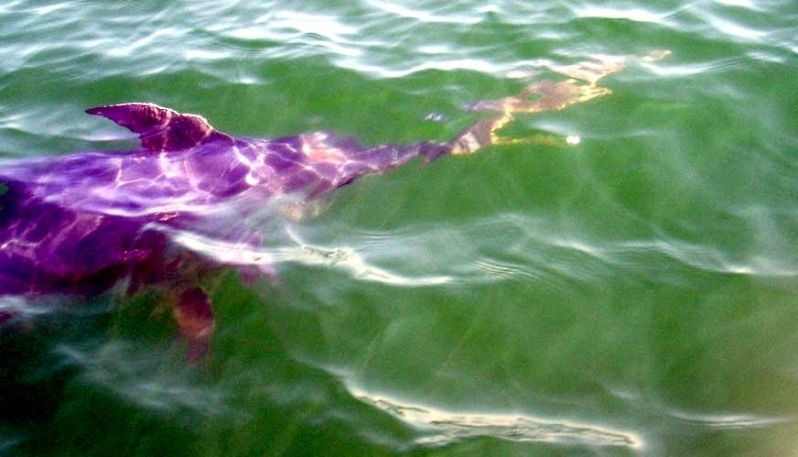 The Swordfish may also use its sword as an aid in swimming. 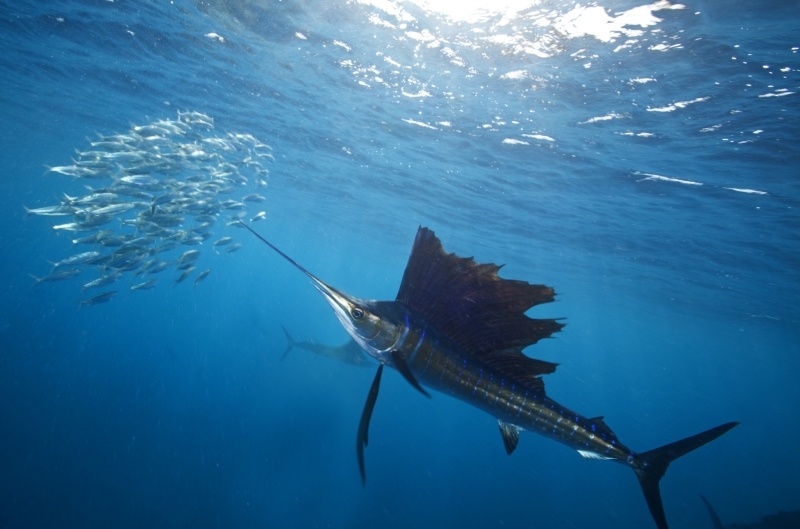 The sword breaks the flow of water, making it easier for them to swim. 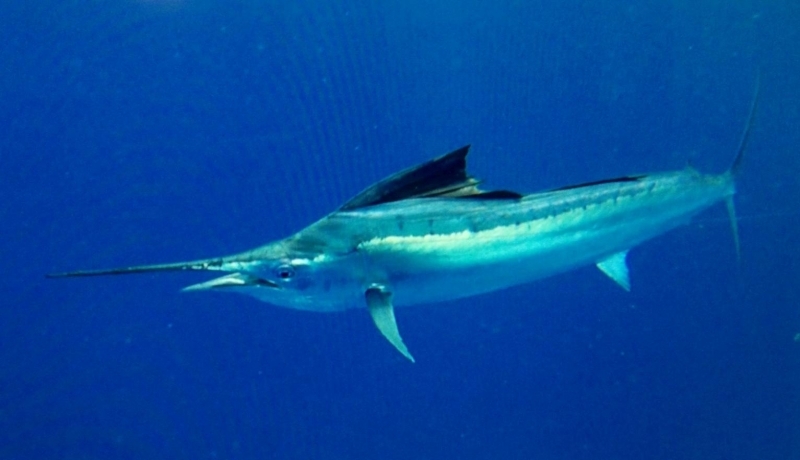 Swordfish are one of the fastest fish on our water planet and can slice through water up to 60 mph. 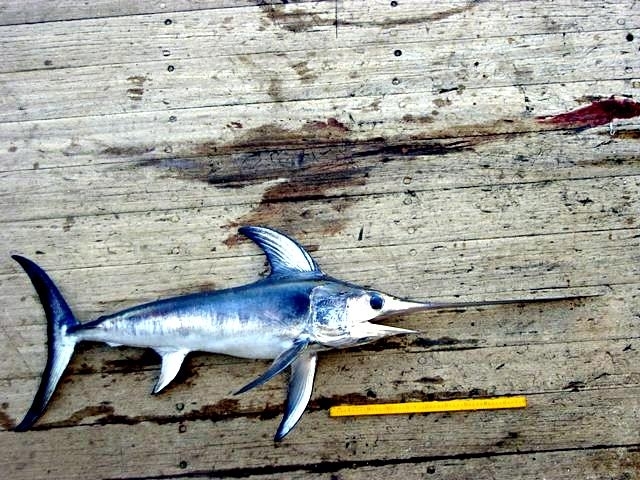 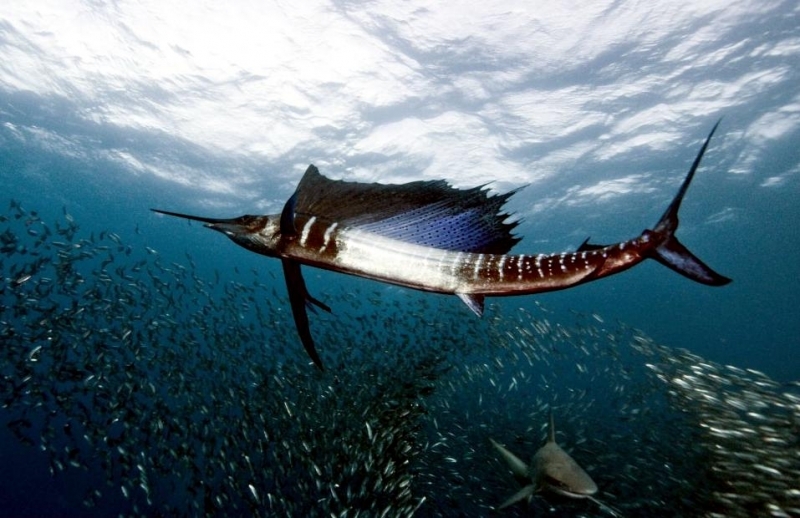 The sword on a Swordfish is about one-third as long as its body.